Pitching SEO services to clients is challenging. You often have to convince them not only that you are better than competing (SEO) agencies, but also that SEO is a marketing channel worth investing in. Here are some tips on how to create an SEO proposal that speaks the client's language and is hard to refuse. To succeed in selling SEO services, a consultant or agency should try to walk in their client's shoes for a while. From a client's perspective, it is usually unclear how SEO works, how likely it is that the targeted results will be achieved, and, most importantly, how this would impact their business. Simply put, clients are budget owners. They don't necessarily think in terms of keywords, ranks or backlinks. While they might be able to relate to these, their decision would be much easier if they saw the metrics that they are primarily interested in: conversions, costs and ROI. These are the figures they would expect to see in an SEO proposal and these are the figures they will use as a frame of reference when comparing marketing initiatives. It is therefore critical to speak the clients' language and present them with figures they can easily understand and trust. This is particularly challenging, as SEO is hard to measure and the search industry is marked by extreme uncertainty. It is precisely here that SEOmonitor's approach comes to help. Our platform will assist you with everything: from identifying and quantifying the opportunity, to understanding the client's current performance against their competitors' and, finally, to realistically estimating future performance. Both you and the client will be able to see how your efforts of improving their ranks in Google would impact the website's non-brand organic traffic. Furthermore, additional traffic is translated into additional revenue, as well as compared with paid advertising, cost-wise. A powerful pitch needs to show the client where the opportunity lies, what can be achieved, how you plan to do it and how your offer is better than any competitor's. SEOmonitor helps you on each level. 1. Analysis of the current performance. Our algorithm for unlocking the not-provided data from Analytics allows the platform to re-distribute the organic traffic back on keywords. In other words, you will have a unique, insightful view into the website's current organic traffic and all the keywords that generate it. The brand/non-brand segmentation enables the isolation of non-brand organic traffic, therefore of SEO performance. If the client is used to the entire organic traffic figures, it might be quite surprising for them to find out that not all organic traffic is SEO traffic. It can also be an opportunity for you to show them that, in reality, they get less SEO traffic than previously thought, hence the need to improve the SEO performance. Once the current situation has been assessed, you can proceed with presenting the SEO opportunity. A necessary step is a thorough keyword research, which will lead to a comprehensive keyword portfolio. It is important to include all of the relevant keywords in the analysis, since all of the metrics, comparisons and forecasts will depend on it. With a complete and well-structured portfolio, spotting the opportunities becomes an easy feat. It is important to be transparent and explain to the client which keyword list you choose to target and why improving ranks on those keywords is achievable: they might be keywords with a low SEO difficulty, they might already rank on Google's second page, the websites ranked above them might not have a higher topical authority, etc. 3. Pressing the "pain button". 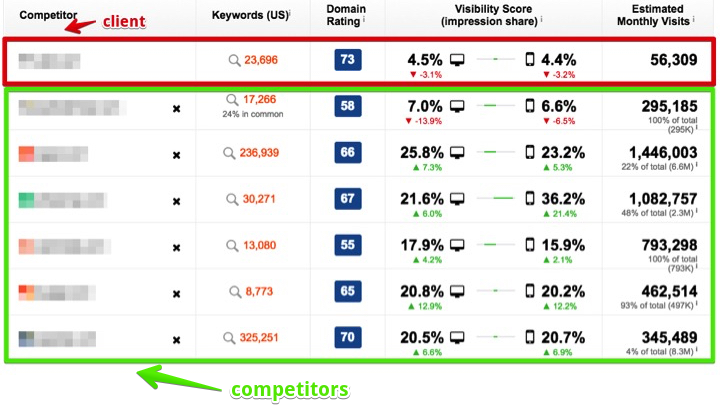 It is now time to press the "pain button" by showing them how they compare with their competitors on the same keyword lists. 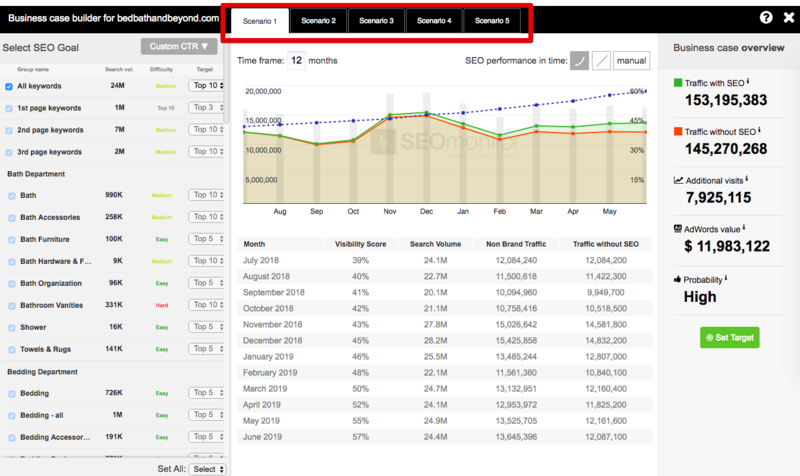 The Competition Insights module will display a desktop and mobile Visibility Score comparison, as well as an estimation of the non-brand organic traffic of each competitor for the selected keywords. 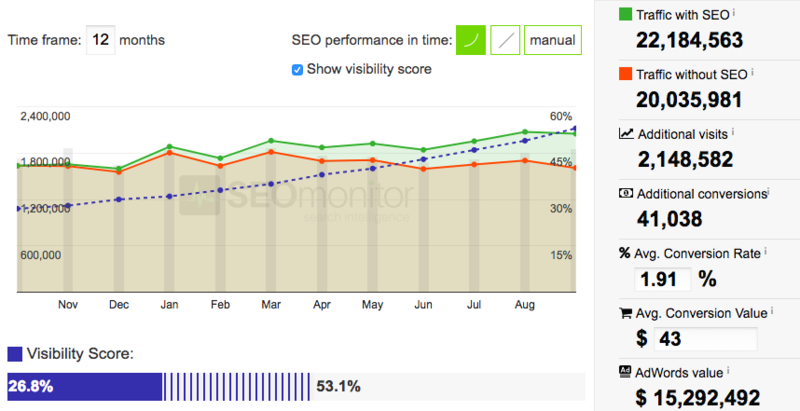 These are powerful figures, because they show the potential of a good SEO campaign. SEOmonitor's award-winning forecasting algorithm will help you translate the results of seizing the above opportunity into quantifiable metrics that the client can relate to: additional non-brand organic traffic and additional conversions. The reliability of the figures is strengthened by taking monthly seasonality and Visibility into account, when estimating future performance. The third part of the SEO proposal should contain a list of deliverables, as well as a clear timetable. Since the forecast also shows a cost comparison with Adwords, this should help you optimally place your financial offer. Be sure to explain how, unlike paid advertising, SEO is rather an investment and not a cost, due to its long-term positive effects. This way, the SEO proposal becomes not only tangible, but also better than those for alternative channels. Super-hint: if you pitch for a news website or local business, you can also show them their visibility in the news top stories or local packs. Apart from the organic traffic segmentation (impossible without connecting the Analytics and the Google Search Console accounts), you will have access to all of the important metrics and features: ranks, Visibility and Opportunity scores, keyword research, competitors' performance and, most importantly, the forecast. If the pitch is successful, these pitching campaigns can later be transformed into regular ones, to be monitored on a daily basis, by connecting Google or Adobe Analytics. Also note that all pitching resources are complimentary, so you can include as many keywords as you want in your analysis, without any additional costs to your subscription. Furthermore, to help you get your best pitch ready, we offer the possibility of setting multiple scenarios for the same campaign. This way, you can prepare, for example, an easier and cheaper target or one that would be more difficult to reach, but could also give you leverage for setting a higher price for your services. And this can be all done using your existing dataset (keywords, groups, etc). Good luck with pitching and let us know how much you increase your client closing rates!